My prima-once removed was posting the cutest pictures on FB, and I had to ask her if I could please, please have Guerra and Negra over for a visit? 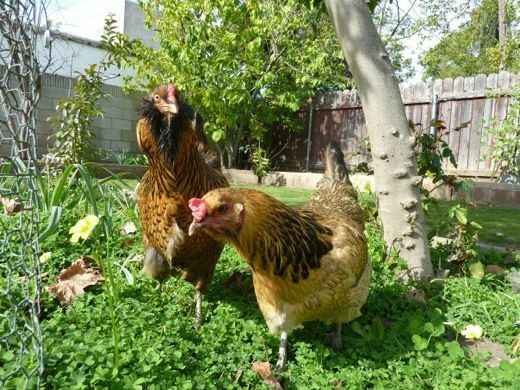 Then I realized Beckie might be thinking that I meant for her to actually drive down from Pasadena with Guerra and Negra, so I went back to FB and clarified that I was thinking of them visiting on Chickenblog... you know, like a guest spot. But wouldn't it be kind of hilarious if they did ride down, stopped at In-N-Out for a veggie burger, then got here in time for a light dust bath, and a bit of chisme with cracked-corn? And isn't it nifty that FB can keep family and friends chatting and exchanging deep thoughts and other musings? I think so. Especially when we are far apart. Geoff's FB status is blank, but I see he did pop in to thank everyone for their birthday wishes. Near or far, FB keeps us in the loop. I am guessing that Negra is the hen with the black scarf. Isn't she elegant? Her fair feathered sister must be Guerra. I think Guerra sees something good to eat. They remind me of our dear Gracie. She was an Ameraucana, and laid green-blue Easter eggs just like Guerra and Negra. Those colored eggs are so pretty. My Mother got them for her 89th birthday. So, she enjoyed them for more than a year before she passed and went to heaven. They were so tiny and delicate, both could fit in the palm of your hand. They brought her so much joy because they followed her around while she did her yardwork. When she would sit down and take a break, they would happily jump up on her lap...just like a cat! Well Negra and Guerra are wonderful egg layers...gorgeous grade AAA blue green eggs. They are inseperable yet competative should you treat them to a hand full of crickets. Reading this made me happy, and a bit sad. But mostly I smile and think how wonderful life can be. Also, if the chicas from up north ever do come to visit I am going to be sure I have a supply of crickets on hand. I never thought to provide such delectables for Lady Betty, but now I know... thank goodness for FB. My they are beautiful! I know my husband and daughters have been wanting me to raise a few. I am still holding off...I really don't need more mouths (beaks) to feed. Oh how cute!! It would be funny if they really came to visit ... LOL. You would have to get some treats. After having chickens since July, I just love them. Every time I open my back door they come running to see if I brought them something. They hopped up on her lap like a cat?? Oh, how I loved that image. Sweet little chicks. Fantastic pictures. 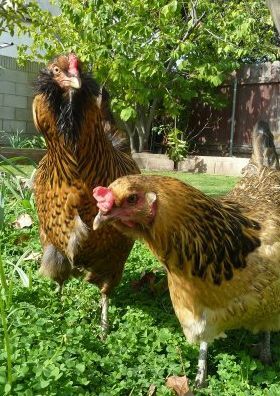 When I am 89 I wish to do yard work with my chickens trailing. Love the chickens. You are on FB?? Hey friend request me. Guerra and Negra are beautiful Ameracaunas! I have two, Puff and Louise (the grandkids named Puff), and they are so sweet. I have chick fever and I'm going to get a few hatching eggs as soon as one of my hens goes broody. Betty definitely needs chicken companions and you need more layers to supply that nice big family of yours! http://roostershamblin.wordpress.com/ hi would you please spend a few minutes of your time and read my blog. 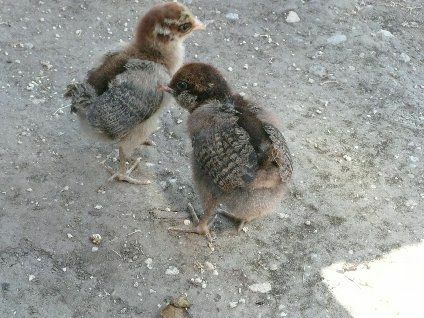 I have been raising more than 50 breeds of chickens for 40 years.